We made it to Husavik, another perfectly picturesque Icelandic town, just in time for our 14:00 whale watching tour, run by a company called North Sailing. The beautiful oak schooner Haukur, built in 1973, was awaiting us in the harbour. Once our group of 12 passengers boarded along with two crew members, we were given big, heavy, warm overalls to wear. Even though the weather on land was gorgeous – blue sky with only a few clouds, little wind – we would absolutely need this warmth very soon. As we set out into the bay, everyone was eager and alert to spot whales, although it was more likely that we would see them further out where the water is deeper. The tour we were on was called Whales, Puffins and Tails, so we were also all on the lookout for those funny little birds. I still hadn’t seen any puffins up close, so my hopes were very high. About 30 minutes after setting out, we reached Lundey, nicknamed Puffin Island. Finally, there they were! They were so much smaller than I realized they would be, flitting through the air, some of them looking like they were about to drop out of the sky. The crew turned off the engines and we floated around the island for a bit, watching the puffins while the captain told us more about the birds. 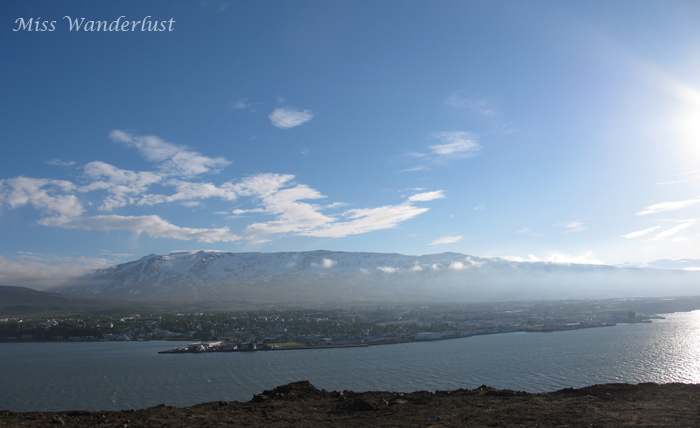 Driving into Akureyri, the view of the town and the surrounding area is incredibly breathtaking. It sits at the end of a fjord with mountains rising up all around it. The sky was such a brilliant blue and the sun was shining so bright, it made the water twinkle in the most beautiful way.